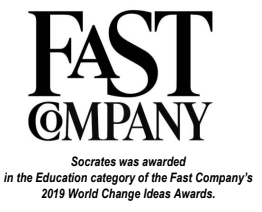 April 10th, 2019, Las Vegas, Nevada – Education Revolution, LLC, the creator of the award-winning Socrates Learning Platform, today announced another accolade, this time from Fast Company’s 2019 World Changing Ideas Awards. Socrates was recognized in the Education category of the Awards. Fast Company’s World Changing Ideas Awards honor products, concepts, companies, policies, and designs that are pursuing innovation for the good of society and the planet. The Socrates Learning Platform is a cloud-based artificial intelligence solution that creates one-to-one learning paths with real-time updates, keeping each student on the optimal learning track. Learning is also fun and engaging for students through Socrates’ uniquely customized games and rewards. Socrates also empowers teachers by giving them the tools that they need to manage increasing classroom sizes. Socrates previously had been awarded a National Science Foundation grant in 2018 for its unique innovation and potential positive impact on society. Students are able to learn up to three-times faster using the Socrates Learning Platform. The World Changing Ideas Awards is now in its third year. A panel of eminent judges selected winners and finalists from a pool of more than 2,000 entries across 16 categories. The categories including such areas as Food, Education, Energy, Transportation and Developing World Technology. Alongside Education Revolution, other awardees included St. Jude’s Children’s Research Hospital, General Motors, Sesame Workshop, Bill and Melinda Gates Foundation, Amazon, Google, and Volvo. feasibility and the potential for impact. With a goal of awarding ingenuity and fostering innovation, Fast Company draws attention to ideas with great potential and helps them expand their reach to inspire more people to start working on solving the problems that affect us all. For more details, click on each respective link: Fast Company or the World Changing Ideas Awards.